Microbial Enumeration tests for nonsterile products, following test procedures outlined in USP <61>, provides an evaluation of the microbial content of a product also known as bioburden testing. USP <62> is the method described for the screening of objectionable organisms or pathogens. The USP <61> and <62> test system requires validation/suitability testing and provides a rugged process for the detection of objectionable organisms. Product-specific objectionable organisms can be determined based on the product type, optimizing the testing process. This test method has defined procedures for the detection of Staphylococcus aureus, Pseudomonas aeruginosa, Escherichia coli, Salmonella species, and fungal organisms, and a quantitative for bile-tolerant gram-negative bacteria. USP <61/62> testing is recommended on all pharmaceutical raw materials, nonsterile products (such as liquids and powders), transdermal patches, and dietary supplements. The advantage of using Nelson Labs is our rugged validation method for the test process, combined with a professional team of experts who provide individualized consultation. We’ll help you design the appropriate test plan for determining the objectionable organisms in your product. The USP <61/62> test system uses the compendia method, as set forth by USP, for the testing of nonsterile pharmaceutical products and other nonsterile articles for bacterial load and pathogenic organisms. USP <61> testing includes an enumeration plate count and suitability testing, which validates the plate count. USP 62 testing evaluates the presence or absence of specific organisms. The suitability test verifies the validity of the testing method by demonstrating that any antimicrobial properties of the product do not inhibit possible recovery of growth. The suitability is performed with inoculation of the product with <100 colony-forming units (CFU) of the defined organisms. USP <61> describes the validation of the plate count preparation and plating method by demonstrating recovery of Staphylococcus aureus, Pseudomonas aeruginosa, Bacillus subtilis, Candida albicans, and Aspergillus brasiliensis on the appropriate media. The testing is performed to determine the total aerobic microbial counts and total yeast and mold counts. The plating of the sample can be performed by membrane filtration, pour plating, or the spread plate method. 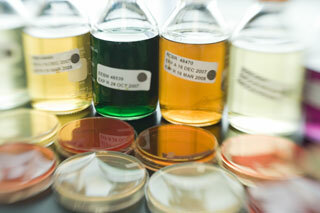 The sample is diluted, plated for the total aerobic microbial count and total yeast and mold count, and incubated. USP <62> analysis is performed to determine the presence of specified microorganisms: Staphylococcus aureus, Pseudomonas aeruginosa, Escherichia coli, bile-tolerant gram-negative bacteria, Clostridia species, Salmonella species, and/or Candida albicans. The test involves an initial enrichment of the sample and then streaking the enriched sample onto selective agars for determination of the presence of the defined objectionable organisms. If you have additional questions about Microbial Enumeration: Nonsterile Product test services, or would like to consult with the experts at Nelson Labs, just send us a request or call us at +1 (801) 290-7500.